Too much nitrogen and phosphorus in the water can have diverse and far-reaching impacts on public health, the environment and the economy. Photo credit: Bill Yates. 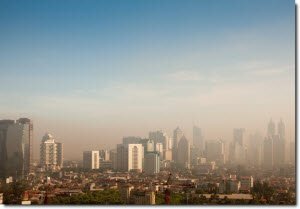 Excess nitrogen in the air can impair our ability to breathe, limit visibility and alter plant growth. Nutrient pollution is one of America’s most widespread, costly and challenging environmental problems, and is caused by excess nitrogen and phosphorus in the air and water. Nitrogen and phosphorus are nutrients that are natural parts of aquatic ecosystems. Nitrogen is also the most abundant element in the air we breathe. Nitrogen and phosphorus support the growth of algae and aquatic plants, which provide food and habitat for fish, shellfish and smaller organisms that live in water. But when too much nitrogen and phosphorus enter the environment – usually from a wide range of human activities – the air and water can become polluted. Nutrient pollution has impacted many streams, rivers, lakes, bays and coastal waters for the past several decades, resulting in serious environmental and human health issues, and impacting the economy. 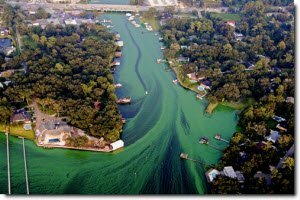 Too much nitrogen and phosphorus in the water causes algae to grow faster than ecosystems can handle. Significant increases in algae harm water quality, food resources and habitats, and decrease the oxygen that fish and other aquatic life need to survive. Large growths of algae are called algal blooms and they can severely reduce or eliminate oxygen in the water, leading to illnesses in fish and the death of large numbers of fish. Some algal blooms are harmful to humans because they produce elevated toxins and bacterial growth that can make people sick if they come into contact with polluted water, consume tainted fish or shellfish, or drink contaminated water. Nutrient pollution in ground water – which millions of people in the United States use as their drinking water source – can be harmful, even at low levels. Infants are vulnerable to a nitrogen-based compound called nitrates in drinking water. Excess nitrogen in the atmosphere can produce pollutants such as ammonia and ozone, which can impair our ability to breathe, limit visibility and alter plant growth. When excess nitrogen comes back to earth from the atmosphere, it can harm the health of forests, soils and waterways.